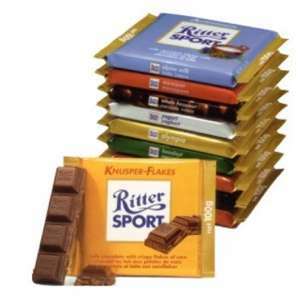 Ritter Sport Bars 3.5 oz. Since 1932, Ritter Sport's squares have evolved into an ever-growing number of delicious new varieties. Thanks to their square shape, our chocolate bars are thick and sturdy, just the thing for active people on the go. This also means that we can fit more our our fine quality ingredients such as whole hazelnuts, raisins yogurt, and almonds into each square. Did you know that eleven different chocolate masses are tailored to each filling, perfectly complementing the ingredients within? These bars have transcended time with nearly 80 years of history. If you haven't already, don't you think it is time to try one or all of the Ritter Sports wafer bars?